Downtown Walnut Creek, CA, was closed this weekend, but it was a good thing. The Walnut Festival Association sponsored Art on the Main. Art, food and beverage is usually available along Main Street, but this weekend, the street was open to foot traffic only. Scores of booths with paintings, photography, ceramics, glass, jewelry, wood, textiles, leather and even tie dye, lined the main drag. There was lots to see and lots of sunshine, too. Freckles are sun damage. 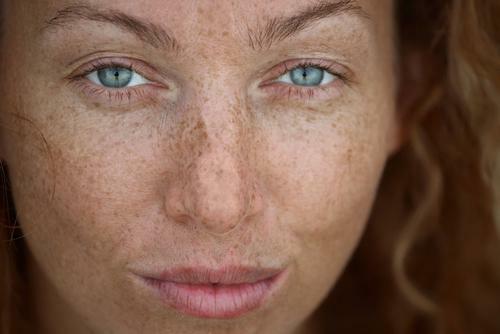 Without sun exposure, freckles never appear. Today in Walnut Creek, SPF could stand for Spring Paintings Festival. When it comes to sunscreen, SPF stands for Sun Protection Factor. It sounds very scientific, maybe even with some math involved, but how is SPF actually calculated? I always imagined sunscreen, meticulously applied to a glass sheet, with UV lasers and collectors measuring the reflection and transmittance of harmful ultraviolet rays. Turns out, it’s much less complicated and accurate. Soldiers sent off to fight World War II were given sun protection prior to shipping out. Nicknamed “red vet pet,” it was a sticky, unpleasant, solar barrier made from red veterinary petrolatum. When Benjamin Green, an airman and pharmacist, returned home and mixed his red vet pet with cocoa butter and coconut oil on his stove, Coppertone suntan cream was born. The modern equation for calculating SPF: A(λ) the erythemal action spectrum, E(λ) is the solar irradiance spectrum and MPF(λ) the monochromatic protection factor, all functions of the wavelength λ. However, the original measurements of SPF were not mathematical. To evaluate the effectiveness and performance of sunscreens, the Coppertone Solar Research Center was established in 1971 in Memphis, TN. Their scientific method involved measuring how long it took pale volunteers to obtain a sunburn, and then slathering them with sunscreen to see how much longer it took. If it took 15 minutes to get a burn without any protection, and 30 minutes with the cream, this was deemed SPF 2. SPF 40, theoretically, would mean 10 hours of protection. How Often To Apply Sunscreen? How quickly we burn is highly variable; moreover, the amount of UV light that reaches us depends on many factors, including cloud cover, the time of day and the reflection of UV rays off the ground or water. Swimming and sweating also dilute and remove sunscreen, so a single application, no matter how strong your SPF, is not enough. Application every two hours is recommended, and more frequently if you are swimming or exercising, even if you are using a water resistant brand. Sunscreen sun on the back under normal and UV light. In the original tests, 2 milligrams of product were applied to each square centimeter of skin. That’s about a fourth of an 8 oz. bottle of sunscreen per application. This is more than most of us use in a single day at the beach or by the pool. So if you want the protection listed on the bottle, it’s hard to put on too much. The only way to know you’ve applied enough is if you are not burned at the end of the day. The best approach is to methodically apply an even coat of sunscreen 20 minutes before going in the sun. Missed areas will not make themselves known until know much later, after they burn. Sprays can help with even application. This long haul trucker, famously featured in the New England Journal of Medicine, has unilateral dermatoheliosis, which means one sided sun damage to his skin. 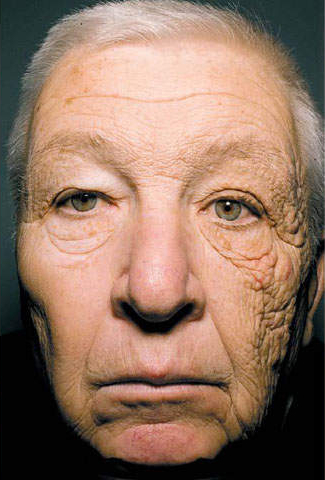 With the sun shining through the driver’s side window over the years, the left side of his face has received more sun exposure than the right side. Even before you burn, your skin is accumulating damage. Direct damage occurs to your collagen and elastin fibers, making the skin more leathery, and to the skin cells’ DNA, disrupting your skin’s ability to repair itself and predisposing you to skin cancer. The result is premature wrinkles, irregular pigmentation and a greater chance of skin carcinoma and worse, melanoma. The San Francisco Bay Area is a great place for outdoor activitie. The best protection would be avoiding the sun altogether, but that’s not realistic for most of us. Limiting the amount of sun exposure, especially midday, helps. Cover-ups, like hats and swim shirts are good. Properly applied water resistant, broad spectrum sunscreen is recommended. With proper reapplication, SPF 15 or greater is recommended for everyone, and SPF 25 or greater if you are prone to skin cancer.